​Kourosh Kanani started his life with the guitar at the age of 8. At 26, he’s now one of the most prominent guitarists on the European Jazz circuit, touring the world and playing at many major festivals and venues with his gypsy jazz quartet “Latchepen” along with his original music trio. The prestigious London Jazz News stated, "Kourosh is the rising star of the guitar". Although almost completely self taught, he has a rich family heritage coming from Persian and Irish decent, laced with musical history. Since making a name for himself on the London Jazz scene, Kourosh has been an inspiration to guitarist's around the world with his unique jazz guitar style that mixes in Middle Eastern folk, Flamenco, and contemporary European classical. For this special celebration of the music of Django and Grappelli, Kourosh will be partnering with Django By the Sea founder and world class violinist Jason Anick. ​One of the youngest violin professors at Boston’s Berklee College of Music, Jason Anick is considered “a rising star in the world of jazz violin” (Downbeat Magazine). In addition to leading his own contemporary jazz ensemble and performing with the Rhythm Future Quartet, Anick has been touring and recording with Grammy award-winning Nashville guitar virtuoso John Jorgenson since 2008 when he was recruited while still a senior at the Hartt Conservatory. A versatile musician and sought after side-man, Anick has also shared the stage with an array of artist like Stevie Wonder, Tommy Emmanuel, Hamilton de Holanda, The Jim Kweskin Jug Band, John Sebastian, Delta Rae, and Girls, Guns and Glory. With performances all over the world from China, Europe, and Japan and renowned venues like the Montreal Jazz Festival, Blue Note, Smalls Jazz Club, Scullers Jazz Club, Yoshi's, Iridium, TD Garden, Regattabar, NPR, and The Late Night Show, Jason has proven himself to be a leader in the ever-growing contemporary string world. Music became his passion at the first sound of the guitar. At 13 while walking home from school he saw two musicians playing classical guitar and it inspired him to take lessons. A citizen of the world, Cesar has lived in the Brazil, Italy, and the United States, each influenced his playing and growth as a musician, teacher and performer. In 2009 Cesar started putting together Samba, Bossa Nova and Chorinho bands, performing in Florence and other regions of Italy. In 2011 he moved to New York City to expand his musical knowledge. In the past 7 years he has performed at Jazz at Lincoln Center, Jazz Standard, Birdland, Columbia University, the Museum of Modern Art, with a monthly residence at Barbes. He has worked with Anat Cohen, Olli Soikkeli and Tim Connell. He has been featured on NPR, NBC and Global. Guitarist, composer, and arranger Max O’Rourke was born and raised in West Rutland, Vermont. His interest in guitar began when he was six and has since progressed into a lifelong journey. While touring around the world with the Gonzalo Bergara Quartet, Rhythm Future Quartet and The Jason Anick Trio, he has built up a significant amount of original work and is now leading his own project. His debut album Disquiet draws from his roots in gypsy jazz and also marks the start of his love for the electric guitar. For this special concert, Max O'Rourke (a Django By the Sea favorite) will be celebrating the electric side of Django Reinhardt. Clarinet virtuoso, Matt Stubbs, will be joining the group. Born in 1998 in Garrison, New York, Sara Labriola started playing guitar at age eight. While originally immersed in classical guitar training and technique, she discovered a love for Django Reinhardt's music at age thirteen and has pursued the style ever since. Under the instruction of renown guitarist, Stephane Wrembel, she began transcribing Django Reinhardt's solos and developing the technique. After finishing high school, Sara moved to New York City and began playing Reinhardt's style of music full-time. At eighteen years old, she made her Carnegie Hall debut, joining the stage with Stephane Wrembel, Stochelo Rosenberg, and Al Di Meola as part of the Django A Gogo festival. She received the 2018 SAGA award for young musicianship at Djangofest Northwest in Langley, Washington and was also a featured artist at the 2018 Stockholm Django Reinhardt festival. Sara has recorded her own solo record as well as a record with her acclaimed orchestral ensemble, Masters of Fright. 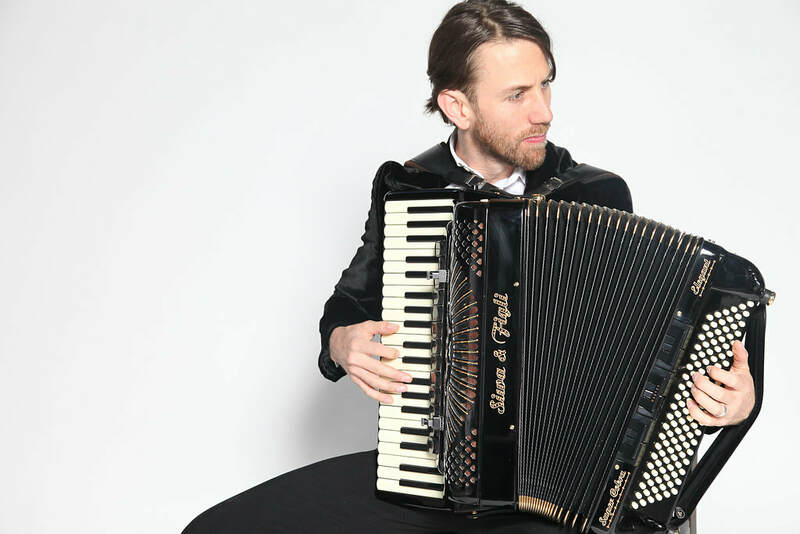 Award-winning accordionist Dallas Vietty is one of the most in-demand accordionists performing jazz and swing in the United States today. Dallas’ unique style comes from his background in the American jazz tradition, as well as study and immersion in the European swing tradition of Django Reinhardt (Gypsy Jazz) and French accordionists. As band leader of two groups (Hot Bijouxx and Musette Project) Dallas remains very active on the East Coast concert and festival scene. His groups have performed at some of the top U.S. festivals including: TEDx Philly, Djangoary Festival. As a sideman his performances have taken him to legendary venues like: The Iridium NYC, BB King’s Time Square, Dizzy's Club at Lincoln Center, and the Philadelphia Kimmel Center. Guests - Max O'Rourke, Kourosh Kanani, Jason Anick, Greg Loughman, and more!